Ostad, S., Hamedi, M., Monsef Esfahani, H., Shariatpanahi, S., Ebrahim, A., Seyedabadi, M., Mohseni, M. (2012). Study on Acute and Subchronic Toxicity, Cytotoxicity and In Vitro Developmental Toxicity of Safflower Extracts of “IL 111” and “LRV 51 51” Cultivars. Iranian Journal of Pharmaceutical Sciences, 8(1), 343-352. Seyed Nasser Ostad; Manochehr Hamedi; Hamidreza Monsef Esfahani; Seyed Mohammad Shariatpanahi; Azizi Ebrahim; Mohammad Seyedabadi; Mehran Mohseni. "Study on Acute and Subchronic Toxicity, Cytotoxicity and In Vitro Developmental Toxicity of Safflower Extracts of “IL 111” and “LRV 51 51” Cultivars". 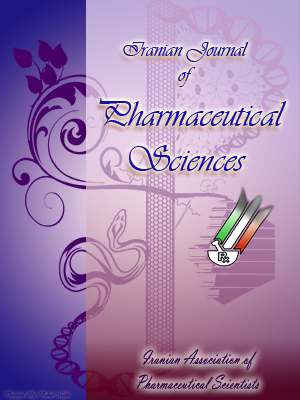 Iranian Journal of Pharmaceutical Sciences, 8, 1, 2012, 343-352. Ostad, S., Hamedi, M., Monsef Esfahani, H., Shariatpanahi, S., Ebrahim, A., Seyedabadi, M., Mohseni, M. (2012). 'Study on Acute and Subchronic Toxicity, Cytotoxicity and In Vitro Developmental Toxicity of Safflower Extracts of “IL 111” and “LRV 51 51” Cultivars', Iranian Journal of Pharmaceutical Sciences, 8(1), pp. 343-352. Ostad, S., Hamedi, M., Monsef Esfahani, H., Shariatpanahi, S., Ebrahim, A., Seyedabadi, M., Mohseni, M. Study on Acute and Subchronic Toxicity, Cytotoxicity and In Vitro Developmental Toxicity of Safflower Extracts of “IL 111” and “LRV 51 51” Cultivars. Iranian Journal of Pharmaceutical Sciences, 2012; 8(1): 343-352. Toxic and direct teratogenic potential of two dominant Iranian cultivars of Carthamus tinctorius (safflower), floret extracts, IL 111 and LRV 51 51, were investigated. The extracts are commonly used in foods and medicinal products. Neither death nor alteration of stereotype activities was observed with IL 111 and LRV 51 51 extracts up to 17 g/kg in 48 h in mice and rats. Haemoglobin was decreased, prothrombin time was prolonged, serum TG, LDH, CPK and cholesterol was increased in rats which received IL 111 (1 g/kg) for 9 weeks (p50: 78 and 106 µg/ml, respectively). The total number of differentiated (stained) limb bud foci was also decreased when cells were exposed to either of C. tinctorius extracts (p<0.01). When the cytotoxicity was taken into account, the ratio of Alcian stained differentiated cells to the cytotoxicity was not significantly altered with any of the extracts, suggesting no remarkable level of teratogenicity. IL 111 and LRV 51 51, two of 30 different cultivars of safflower, Carthamus tinctorius L, Asteraceae, are commonly cultivated in Iran . IL 111 has red-colored florets, without spiny leaves, while LRV 51 51 has yellow florets and spiny leaves. Safflower cultivar crops are universally used for coloring (red dyes, yellow dyes), flavoring in foods and medicines. Safflower oil is used as cooking oil, in salad dressing and for the production of margarine, as well as a nutritional supplement. The safflower flowers are used as a cheaper substitute for saffron [2, 3]. A transgenic safflower plant is currently being used in the pharmaceutical industry (SemBioSysl) to produce human insulin. In traditional medicine, safflower has been indicated for its sedative, laxative and anti-inflammatory properties [4, 5]. Potential benefits of safflower have also been demonstrated in hypercoagulopathy, hypertension, hepatoprotection, neuroprotec-tion, inhibition of melanin production as well as antioxidant and anti-tumor activities [6-8]. On the other hand, due to its immunosup-pressant effects, Safflower is recommended to be cautiously utilized in situations where the immune system is disturbed [9, 10]. Although Safflower is reported to be useful for menstrual problems, it is forbidden in pregnancy because of uterine stimulant property . Flavonoides, phenylethanoid glycosides, coumarins, fatty acids, steroids and polysaccharides are among the safflower floret components , and might be responsible for the effects observed. Botanical properties of safflower and its medical application have encouraged the improvement of its cultivars all over the world; therefore, evaluation of acute and subchronic toxicity, potential mutagenicity, cytotoxicity and teratogenicity of these medicinal plants are important. In our previous study, we observed that IL 111 did not elicit a significant level of mutagenic activity in TA98 and TA100 strains of Salmonella typhimurium using Ames assay . In this study, we aimed to evaluate the acute and subchronic toxicity of IL 111 and LRV 51 51 in mice and rats, their potential cytotoxicity on murine fibroblasts, and their direct teratogenic effects on embryonic cells. Table 1. Haematological and biochemical study rats treated with safflower extracts for 9-weeks. *Significantly difference from control group (p < 0.05 ); (n=6); WBC, white blood cell count; RBC, red blood cell count; Hb, Hemoglobin; Hct, Hematocrit; MCV, mean corpuscular volume; MCH, mean corpuscular haemoglobin; MCHC, mean corpuscular haemoglobin concentration; PT, prothrombin time; AST, aspartate aminotransferase; ALT, alanine aminotransferase; ALP, alkaline phophatase; LDH, lactate dehydrogenase; CPK, creatine phosphokinase. Dulbecco’s modified Eagle’s medium (DMEM), penicillin-streptomycin, fetal bovine serum (FBS), trypsin-EDTA, DMEM- F12 and L-glutamine were supplied by Gibco, UK. MTT (3-(4, 5 dimethylthiazol-2yl) 2, 5 diphenyl tetrazolium) was provided by Sigma, USA. Nylon mesh was obtained from Portex, UK. IL 111 (red florets) and LRV 51 51 (yellow florets), obtained from the Seed and Plant Improvement Institute (Karaj, Iran), and authenticated at the gene bank of ministry of Agriculture of Iran where their voucher specimens are deposited as tn-79813 and tn-79812, respectively. Legitimate [authenticated and negative for aflatoxines] dried florets (20 g) were minced and macerated in ethanolic solution (70%) for 3 days at room temperature. The corresponding extracts were filtered, desiccated by freeze dryer (Labconco, USA), and stored at 4-8 ºC. Ethanol was totally removed during freeze-drying and the solutions of extracts for each experiment were prepared every week. Figure 1. Effects of C. tinctorius (IL 111 & LRV 51 51) on food consumption and body weight (n=6). The rats were treated with IL 111 and LRV 51 51 extracts for 9 weeks. A: Animals were monitored daily and the average amount of food/rat/week was calculated. B: Animals were weighted individually and the results are depicted against time (week). There is not a statistically significant difference between the extracts and control groups. Figure 2. Cytotoxicity of C. tinctorius (IL 111 and LRV 51 51) in Balb/C fibroblast cells. Cells were exposed to different concentration of extracts for 72 h and MTT assay was applied to study the cytotoxicity. Both of the extracts caused a dose dependent reduction in cell viability ( p < 0.05 ); however there is not a statistically significant difference between the extracts (two-way ANOVA; n=6). Table 2. Final body weight and organ index in rats treated with safflower extracts for 9-weeks. No significant difference was observed between treatment and control groups (n=6). Wistar albino rats and Balb/c mice (Pasteur, Iran), were maintained in animal house of Tehran University of Medical Sciences in 12/12 h light/dark cycle at 21±2 °C. Food and water were available ad libitum. After 10 days of acclimatization and ensuring about their healthiness, animal studies were initiated. The experimental protocol was approved by the Research and Ethics Committee of Tehran University of Medical Sciences. Forty five male Wistar rats (weight: 200±20 g; age: 3 months) and 45 male Balb/c mice (weight: 25±5 g; age: 2 months) were divided into 9 groups consisted of 5 rats and 5 mice. Overnight fasted animals received 0.5, 1, 15 and 17 g/kg of extracts dissolved in normal saline, whereas control groups were treated only with normal saline. The extracts were administered orally in a total volume of 0.2 ml for mice and 0.5 ml for rats. Mortality rate, clinical and behavioral presentations such as stereotype activities were monitored for 48 h as described previously . Germany, and submitted to haematoxylin-eosin staining; pathological examinations were accomplished with Olympus BX-100 . Figure 3. Effects of C. tinctorius (IL 111 and LRV 51 51) on differentiation and viability of limb bud cells (n=8). Limb bud cells were prepared and exposed to extracts for 72 h. At the end of treatment, A: differentiation was studied by Alcian blue staining method; B: cytotoxicity was evaluated by Trypan blue dye exclusion; C: the ratio of differentiation to cytotoxicity was determined to study the teratogenicity. Although the extracts caused a dose dependent effect in differentiation and viability of limb bud cells, normalization of differentiation to viability revealed that they cannot be considered as biologically teratogen. Table 3. Histopathological evaluation of rat organs treated with Safflower Extracts. Assessment of cytotoxicity was based on the reduction of tetrazolium salt by mitochondrial dehydrogenase. Balb/C 3T3 fibroblast cells (Pasteur Institute, Iran) were cultivated in DMEM, supplemented with 4.5 g/l glucose, 2 mM glutamine, penicillin (100 IU/ml), streptomycin (100 µg /ml) and 10% FBS. Cells were plated at 1×104 in 96-well (Nunc, Denmark) and permitted to proliferate at 37 °C in a humidified atmosphere with 5% CO2 to get their logarithmic phase of growth and were then subjected to different treatments. At the end of each experiment, MTT was added and cells were incubated at 37 °C for another 4 h; formazan crystals were finally dissolved in DMSO and optical density was measured at 550 nm. Trypan blue dye exclusion test were also performed to evaluate the validity of indirect assay. IC50 values were then calculated and the data are expressed as percent of control. Micromass culture was accomplished as previously described . Briefly, at the day 13th of gestation Wistar rats embryo limb bud tissues were removed, equilibrated in dissociation medium and disaggregated by triturating through a Pasteur pipette and passaging through a 50 µm nylon filter mesh. The resulting cell suspension was subsequently utilized for micromass culture in DMEM-F12 containing FBS (10%) and L-glutamine (455 µg/l). Cells were fixed with 10% formalin containing 1% cetylpyridinum HCl (w/v) for 20 min. at room temperature. The number of stained foci was subsequently designated according to Flint and Orton in which chemicals are considered as potent teratogen when the ratio of differentiation/ cytotoxicity values are equal to 0.5 or less where the control group is attributed 1 . Retinoic acid (90 µg/ml), which can hinder more than 90% of limb bud differentiation, was used as positive control . The data are represented as the means±SD; one way ANOVA followed by tukey test was applied to study the differences in hematological and biochemical factors in subchronic toxicity study. The effects of the increasing concentrations of safflower extracts and the differences between the two extracts in the in vitro studies were assessed by two-way ANOVA; p values less than 0.05 were considered statistically significant. All statistical computations were performed with SigmaPlot Version 11 package. Acute toxicity studies were conducted for both IL 111 and LRV 51 51 extracts in mice and rats. Neither death, nor alteration in stereotype activities was observed during the 48 h observation period after administration of different doses of both extracts up to 17 g/kg. Therefore, a single dose of both extracts (1 g/kg/day) was selected for sub chronic investigation . Absolute organ weight, organ:body weight ratios or macroscopic sight of the organs were not noticeably affected by any of the C. tinctorius extracts (Table 2). On the other hand, microscopic evaluation of the tissues showed some abnormalities in liver, spleen and kidney in both IL 111 and LRV 51 51 groups which are described in Table 3. Treatment of Balb/c 3T3 cells with IL 111 and LRV 51 51 extracts led to a dose dependent decline in the viability of cells compared to control (pC. tinctorius extracts for 72 h and MTT assay revealed that the IC50 values in Balb/c cells were 394 µg/ml and 429 µg/ml for IL 111 and LRV 51 51 variants, respectively (Figure 2). However, Two-way ANOVA revealed no statistically significant difference between IL 111 and LRV 51 51 cytotoxicity in Balb/c cells (p=0.898). Exposure of limb bud cells to safflower extracts resulted in a dose dependent reduction in the viability of cells compared to control group (p < 0.001; Figure 3B). Cells were treated with different concentration (1, 10, 100 and 1000 µg/ml) of C. tinctorius and trypan blue assay showed that limb bud cells proliferation was reduced to 50% of control by IL 111 at 78 µg/ml and LRV 51 51 at 106 µg/ml. There was no remarkable difference between two C. tinctorius extracts cytotoxicity in limb bud cells (p= 0.243). The total number of differentiated limb bud foci was also decreased when cells were exposed to C. tinctorius extracts (pp < 0.05), the former having higher potency in declining the number of differentiated cells. On the other hand, when the number of stained cells was normalized to the cytotoxicity of extracts, it was revealed that none of the extracts caused a remarkable level of teratogenicity which is characterized by values equal to 0.5 or less in differentiation/cytotoxicity ratio where the control group is designated 1 (Figure 3 C). With either extracts, there were no effects on survival, clinical signs, or behavioral changes, in mice and rats, after a single oral administration up to 17 g/kg. Therefore, Iranian safflowers can be categorized as “relatively harmless” in acute toxicity category . Subchronic administration of IL 111 resulted in a decrease in hemoglobin concentration as well as prolongation of prothrombin time and an increase in LDH, CPK, TG and cholesterol (Table 1). Liu et al. (2004), in a 90-day subchronic toxicity study of hydroxysafflower yellow A (180 mg/kg/day) in male Sprague-Dawley rats, the dominant fragment of the safflower yellow pigments, reported no significant alteration of the levels glucose, cholesterol, alkaline phosphatase (ALP), total bilirubin (TBIL), blood urea nitrogen (BUN), total protein (TP), albumin, alanine aminotransferase (ALT), aspirate aminotransferase (AST), creatinine, magnesium, calcium, natrium and potassium. However, it was observed to prolong blood coagulation time, increase kidney and liver indices (organ/body weight) and cause slight nephrotoxicity . This is somewhat consistent with our histopathologic findings of kidney and liver abnormalitites by C. tinctorius extracts. Zhu et al. have shown that safflower could have a neuroprotecive effect at doses as low as 6.0 mg/kg  in rats, thus one must consider that the moderate toxicity that we observed has occurred in much higher doses. In addition, Grimm et al. demonstrated an immunosuppression property for safflower oil (9 g fat/Kg b.w./day) . We observed the IC50 values of IL 111 and LRV 51 51 extracts to be 394 and 429 µg/ml in balb/c 3T3 cells, correspondingly, and the rat embryo limb bud cells appeared to be more vulnerable to the toxic effects of both extracts than are the balb/c 3T3 cells. A mixture of ginseng and Carthamus tinctorius has also been demonstrated to hamper proliferation and elicit apoptosis in breast cancer cell lines . On the other hand, Kinobeon A which can be isolated from safflower diminishes the production of thiobarbituric acid reactive species in NADPH-induced microsomal lipid peroxidation scheme and improves survival of Madin-Darby bovine kidney cells when exposed to oxidative reagents . The mammalian embryo can itself be cultured for a limited period of time and the limb bud cells of rat embryos can differentiate into a number of cell types including cartilage, which makes it possible to examine the effects of teratogens [22, 23]. In this in vitro embryotoxicity assay, 50% reduction of dif-ferentiation is considered as an indication of biological difference for teratogenicity; with this approach 93% of teratogens and 89% of non-teratogens have been correctly identified [24-27]. The decrement in limb bud differentiation by C. tinctorius might indicate a teratogenic potential, however, these results confounded by the reduction of cell number, reflect a cytotoxic effect of IL 111 and LRV 51 51 on embryonic cells rather than a differentiation challenge and the reported teratogenic effects for safflower in animal studies may emanate from the effects of extracts on placenta or an indirect impact on embryo. We observed that IL 111 extract produced higher biochemical and histological toxicity in subchronic study as well as higher potency in declining the number of differentiated limb bud cells. Fan et al. have found remarkable variations in the content of different compounds in safflower samples gathered from different areas in China . Although the chemical composition of safflower extracts from India  and China  are investigated and it is described that flavonoides, phenylethanoid glycosides, coumarins, fatty acids, steroids and polysaccharides are main safflower floret components, such a study is necessary for Iranian safflower in order to explain the differences in toxicity of IL 11 and LRV 51 51. In our previous study we have demonstrated that IL 111 extracts did not induce mutagenicity in TA98 and TA100 strains of Salmonella typhimurium using Ames assay . On the other hand, Nobakht et al. administered the extract by gavage on days 0 to 8 of gestation and described that water extracts of safflower at doses of 1.6 and 2 mg/kg/day elicited embryos abortion, whereas at lower doses it altered cellular dimension, orientation and degeneration in the neural tube of GD 13 embryos . They have also described that safflower extracts have elicited a dose-dependent cytotoxicity in B65 rat nervous cell line . Bahmanpour et al. reported that C. tinctorius might affect the early development of the embryo due to its induction of congenital malformations like exencephally, spina bifida and tail and limb necrosis . Both of the above-mentioned studies have treated pregnant mice with safflower extract and evaluated its in vivo effects on embryo, and may reflect an influence of safflower on placenta rather than the fetus itself. In addition, they have mainly observed the effects of C. tinctorius on nervous system, whereas our results more likely reflect the direct impacts of IL 111 and LRV 51 51 extracts on differentiation of limb bud cells, in the absence of maternal (i.e. metabolism, toxicity) and placental influences. According to our results, IL 111 and LRV 5151 as dominant cultivars of Iranian safflower was relatively harmless in the acute toxicity paradigm described; they induce slight hematological, biochemical and pathological changes in subchronic exposure; they provoke a level of cytotoxixity in Balb/C 3T3 and limb bud cells but cannot be categorized as teratogenic. This project has been financially supported by the deputy of research of Tehran University of Medical Sciences. The authors would like to appreciate Mr. A. H. Omidi’s efforts in identification and collection of safflower cultivars, and express their gratitude to the staff of animal lab and cell culture lab for their help and support. Mozaffarian V. A Dictionary of Iranian Plant Names. Farhang Moaser, Tehran, 1996, p. 102. Amin G. Popular medicinal plant of Iran. Tehran: Health Ministry Press, 1991. Khan M, Von Witzke-Ehbrecht S, Maass B, Becker H. Relationships among different geographical groups, agro-morphology, fatty acid composition and RAPD marker diversity in safflower (Carthamus tinctorius). Genetic Resources Crop Evolution 2009; 56: 19-30. Jin Y, Xu D, Xu W. Influence of safflower injection on hemorheology of patients of chronic cor pulmonale during acute attack. Zhongguo Zhong Xi Yi Jie He Za Zhi 2000; 20: 430-2. Zuolin Z. The curative effects of Tao-Hong-Si-Wu decoction for treatment on cerebral embolism of 32 cases. Correspondence Traditional Chinese Med 1992; 11: 44-5. Fan L, Zhao HY, Xu M, Zhou L, Guo H, Han J, Wang BR, Guo DA. (2009). Qualitative evaluation and quantitative determination of 10 major active components in Carthamus tinctorius L. by high-performance liquid chromatography coupled with diode array detector. J Chromatogr A 2009; 1216: 2063-70. Zhu H, Wang Z, M, C, Tian J, Fu F, Li C, Guo D, Roeder E, Liu K. (2003). Neuroprotective effects of hydroxysafflor yellow A: in vivo and in vitro studies. Planta Medica 2003; 69: 429-33. Zargari A. Medicinal Plants. Tehran: University of Tehran Press, 1992; 353-63. Ando I, Tsukumo Y, Wakabayashi T, Akashi S, Miyake K, Kataoka T, Nagai K. Safflower poly- saccharides activate the transcription factor NF-kappa B via Toll-like receptor 4 and induce cytokine production by macrophages. Internat Immunopharmacol 2002; 2: 1155-62. Grimm H, Bohnet U, Brang EM, Friese G, Schmidbauer G, Schuck R. (1996). Immunosup- pression by parenteral lipid emulsions in a model of defined immunostimulation. Arch Latinoam Nutr 1996; 46: 269-74. Shi M, Chang L, He G. Stimulating action of Carthamus tinctorius L., Angelica sinensis (Oliv.) Diels and Leonurus sibiricus L. on the uterus. Zhongguo Zhong Yao Za Zhi 1995; 20: 173-5. Ecobichon DJ. The basis of toxicity testing, Boca Raton, FL: CRC Press LLC, 1997. Ostad SN, Khakinegad B, Sabzevari O. Evaluation of the teratogenicity of fennel essential oil (FEO) on the rat embryo limb buds culture. Toxicol in vitro 2004; 18: 623-7. Flint OP. in vitro tests for teratogens: desirable endpoints, test batteries and current status of the micromass teratogen test. Reprod Toxicol 1993; 7 (Suppl 1): 103-11. Lewis CA, Pratt RM, Pennypacker JP, Hassell JR. Inhibition of limb chondrogenesis in vitro by vitamin A: alterations in cell surface characteris- tics. Dev Biol 1978; 64: 31-47. Liu Z, Li C, Li M, Li D, Liu K. The subchronic toxicity of hydroxysafflor yellow A of 90 days repeatedly intraperitoneal injections in rats. Toxicology 2004; 203: 139-43. Kanehira T, Takekoshi S, Nagata H, Matsuzaki K, Kambayashi Y, Osamura RY, Homma T. A novel and potent biological antioxidant, Kinobeon A, from cell culture of safflower. Life Sci 2003; 74:87-97. Flint OP, Orton TC. (1984). An in vitro assay for teratogens with cultures of rat embryo midbrain and limb bud cells. Toxicol Appl Pharmacol 1984; 76: 383-95. Teramoto S, Takahashi K, Kikuta M, Kobayashi H. (1998). Potential teratogenicity of 3-chloro-4- (dichloromethyl)-5-hydroxy-2(5H)-furanone (MX) in micromass in vitro test. J Toxicol Environ Health A 1998; 53: 607-14. Spielmann H, Seiler A, Bremer S, Hareng L, Hartung T, Ahr H, Faustman E, Haas U, Moffat GJ, Nau H, Vanparys P, Piersma A, Sintes JR, Stuart J. The practical application of three validated in vitro embryotoxicity tests. The report and recommendations of an ECVAM/ZEBET workshop (ECVAM workshop 57). Altern Lab Anim 2006; 34: 527-38. Caplan AI, Syftestad G, Osdoby P. (1983). The development of embryonic bone and cartilage in tissue culture. Clin Orthop Relat Res 1983; 174:243-63. Kistler A. (1987). Limb bud cell cultures for estimating the teratogenic potential of compounds. Validation of the test system with retinoids. Arch Toxicol 1987; 60: 403-14. Kistler A, Howard WB. (1990). Testing of retinoids for teratogenicity in vitro: use of micromass limb bud cell culture. Methods Enzymol 1990; 190: 427-33. Nagaraj G, Devi Nirmala G, Srinivas CVS. (2001) safflower petals and its chemical composition. In: Proceedings of the fifth inernational safflower conference. Williston, ND-USA; 2001, pp. 33-27. Nobakht M, Fattahi M, Hoormand M, Milanian I, Rahbar N, Mahmoudian M. (2000). A study on the teratogenic and cytotoxic effects of safflower extract. J Ethnopharmacol 2000; 73: 453-9. Bahmanpour S, Javidnia K, Arandi H. (2003).Weight and crown-rump length reduction, growth maleformation and pregnancy outcome in Carthamus tinctorius L. treated mice. Arch Iranian Med 2003; 6: 117-20.